It is the oldest known pattern in ebru. It is also called Tarz-i Kadim (old style) battal ebru. There are also variations of the design. Colors are simply applied with a brush without using a comb or an awl. However, it is harder than it seems and the application requires mastery. A marblers skill is assessed by looking at his battal designs. 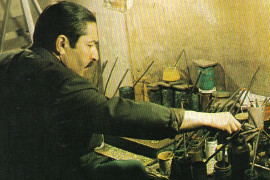 Mustafa Düzgünman says: "Battal ebru is the prime school of ebru". Somaki battal, neftli battal, serpmeli battal are the subtypes of battal ebru. Gel Git pattern is made using an awl and by drawing parallel lines in a back-and-forth manner on a battal ebru. It can be either vertical or horizontal. A rake can be used also. By creating a Gel Git pattern perpendicularly over another Gel Git, we get Taramalı ebru. Over a Gel Git or Taramalı ebru, we draw wavy or freestyle lines to get a shawl design. Overdoing the lines breaks up the colors and the pattern loses its effect. Serpme (a light stone pattern) can be applied on battal, gel git and shawl patterns. We call the final pattern serpmeli battal, serpmeli gel git or serpmeli shawl Colors with turpentine or very light colors are used for serpme. Only a little color should be used for tiny speckles. On a stone pattern, we draw clockwise or counterclockwise spirals with an awl. For a standard 35 x 50 cm tray, we can place 4x5=20 spirals. A snail design can be applied also on a gel git pattern or a combed pattern. This pattern is obtained by applying a comb or rake perpendicularly over a gel git pattern. Nonpareil, Peacock, American are variations of combed designs. On a Nonpareil, we can apply gel git, shawl or freestyle designs with a thin awl. The size for this type of ebru must be less concentrated and the colors must contain more water and ox gall than normal battal colors. 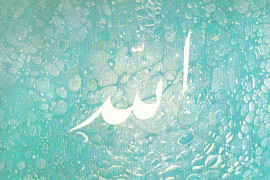 Light ebru papers are used for calligraphy and teship. We make a type of light ebru to serve as a background in hatip design or flower designs. We prepare three versions of the same color: (in order of application) with less ox gall, with more ox gall, with turpentine. We usually use light colors to make the design stand out against the background. Shifted design can be applied over any other design. When placing the paper, instead of laying it down smoothly, we gradually slide it on the surface to have an effect of shaded lines. It is also called drunken marbling or Spanish marbling. 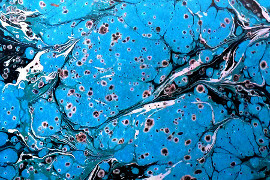 After spreading to Europe, this technique was developed by adding materials like potassium carbonate and aluminum sulfate into the ebru paint. Colors are applied with an eyedropper on the surface of an overused ebru size. The condition of the size causes this grainy pattern. Turbot gall instead of ox gall gives better results in making Kumlu ebru. Mostly Lahore indigo is used. 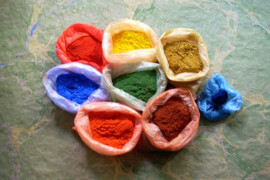 The colors must contain less water and less ox gall than normal. Created by applying another layer of ebru over a marbled paper. This design was named after Hatip Mehmed Efendi, who was the preacher of Hagia Sophia Mosque in 18th century. The colors are applied with an awl or eyedropper on a light ebru in a certain pattern (usually 4x5=20 drops) or randomly. Two or more colors are applied one inside the other to create colorful circles. Then those circles are shaped into hatip designs by moving an awl through horizontally, vertically or diagonally. Some of the hatip designs are yürekli, taraklı yürek, yıldız, çarkıfelek, menekşe etc. When some or all of those different designs are applied on a single paper, it is called Hatip-i Mütenevvia. After the invention of hatip designs, there existed also primitive flower designs in ebru. In 20th century, Necmeddin Okyay has developed flower designs to a degree that flowers such as tulips, carnations, poppies, roses etc. 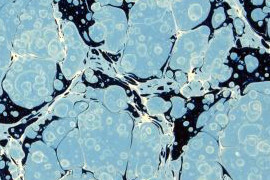 were represented as close to their natural form with marbling techniques. After making a stem and leaves, flowers are made. Colors for hatip and flower designs must be well steeped and more concentrated compared to the colors we use for other designs, so that it is easier to get the desired form. Akkase is a method of bookbinding of old times, where the text with a certain background color/design is framed by a different color/design. 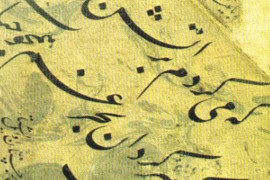 This method was applied to ebru. While in former times acacia gum was used for akkase, nowadays stencils are used to create more complicated designs.